Fr. John Gatzak sits down each Sunday with The Most Rev. 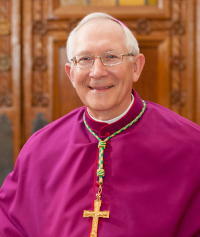 Leonard P. Blair, Archbishop of Hartford, about the religious issues of the day and the Archbishop answers questions submitted by the listening audience. The Archbishop's Corner airs each Sunday at 7:00 a.m. and 1:00 p.m.
Powered by Podcast Generator, an open source podcast publishing solution. | Theme based on Bootstrap. 15 Peach Orchard Rd, Prospect, CT 06712-1052 U.S.A.